Huzzah! No April foolin' here. It's the first of the month, which means that it's time for your AudioSynced Roundup! 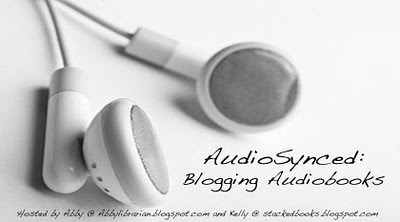 If you're looking for some great audiobooks, check out the following reviews from around the blogosphere. And, as always, if I missed your link, leave it in comments and I'll add you to the roundup! Didn't review or post about audiobooks this month? Don't worry - AudioSynced will be back at STACKED next month. The Fifth Annual Tournament of Audiobooks is going on right now at Audible.com! 32 of 2011's top audiobooks (Editors' Picks, Customer Favorites, Bestsellers, and Critically Acclaimed) are pitted against each other. One will emerge victorious! You are invited to participate in The Armchair Audies! Audiobook enthusiasts will be choosing a category or two from the Audie nominees, listening to all the nominated titles, and posting their predictions during the week of May 28th before the awards are announced. Click on through for more info about how to participate! The Chicago Tribune ran an article about Audible's new line of A-List audiobooks: audiobooks read by some of today's top actors. Create and submit a video promoting audiobooks and you could win the Audio Publishers Association's "Get Caught Listening" video contest for a cash prize of up to $5,000! Entries are due by May 15, 2012. Catie, Flannery, and Tatiana at The Readventurer are posting about some of their very favorite audiobooks. Can the same narrator be excellent for one book and unimpressive for another? Absolutely, and Kim at STACKED is posting about this very experience. Of course, don't forget about Audiobook Jukebox for lots more audiobook reviews! Ghetto Cowboy by G. Neri, read by JD Jackson, reviewed by Lee at Reading With My Ears. Lee says, "The narrator JD Jackson... sounds completely natural voicing Cole as well as the novel's many other characters. If his voice sounds a little mature, he more than makes up for it with a youthful rhythm and streetwise inflections." The Girl Who Circumnavigated Fairyland in a Ship of her Own Making, written and read by Catherynne Valente, reviewed by Stormcrow at Audiobook Heaven. Stormcrow says, "Valente has a great voice for narration and her passion for the characters that she created really shows in her reading." The Mighty Miss Malone by Christopher Paul Curtis, read by Bahni Turpin, reviewed by Allison at Everyday Reading. Allison says, "[Bahni Turpin's] performance as the audiobook narrator really brings this story to life. She has an incredible range, doing a masterful job with women, men, and children's voices alike." Lee at Reading With My Ears also reviews The Mighty Miss Malone. Lee says, "[Bahni Turpin] reads the novel with the right amount of smarts and with a busybody-ness that's perfect for this 12-year-old know-it-all." The Wonderful Wizard of Oz by L. Frank Baum, read by Anne Hathaway, reviewed by Bob at The Guilded Earlobe. Bob says, "Anne Hathaway’s reading allows you to fully immerse yourself in this Wonderful tale." Firelight by Sophie Jordan, read by Theresa Plummer, reviewed by Melissa at Mel's Books and Info. Melissa says, "Plummer does an adequate job with the narration, but her voice might have been a bit too soothing, or perhaps lacking enough emotion to keep me invested in the production." The Midnight Zoo by Sonya Hartnett, read by Richard Aspel, reviewed by Lisa at Shelf-employed. Lisa says, "Listeners who persevere will be rewarded with a stellar performance." Pandemonium by Lauren Oliver, read by Sarah Drew, reviewed by Abby at The Lupine Librarian. Abby says, "The cliffhanger ending of Pandemonium will make you count the days until the release of the final book in the series!" The Ruins of Gorlan by John Flanagan, read by John Keating, reviewed by Melissa at Mel's Books and Info. Melissa says, "Keating’s narration and the audio production is clear and free of flaws, which makes for an enjoyable listening experience." The Scorpio Races by Maggie Stiefvater, read by Steve West and Fiona Hardingham, reviewed by Allison at Reading Everywhere. Allison says, "Steve West as Sean and Fiona Hardingham as Puck deliver solid, rich performances and bring so much life to the characters." This Dark Endeavor by Kenneth Oppel, read by Luke Daniels, reviewed by Beth at Nerdy Book Club. Beth says, "I judge an audiobook’s success on how much I look forward to my long work commute everyday and this was one of those audiobooks that helped me forget I spend two hours a day in the car." Why We Broke Up by Daniel Handler, read by Khristine Hvam, reviewed by Lee at Reading With My Ears. Lee says, "[Khristine Hvam] is pretty darn perfect as Min. She captures Min's superior intellect along with her superiority, yet is as capable of showing her insecurities." Zombies Vs. Unicorns, ed. by Holly Black and Justine Larbalestier; read by Ellen Grafton, Nick Podehl, Kate Rudd, Julia Whelan, and Phil Gigante; reviewed by Laurie at Bay State Readers' Advisory. Laurie says, "I enjoyed most of the stories, but Meg Cabot’s story Princess Prettypants was my favorite of the humorous ones." Eat Pray Love written and read by Elizabeth Gilbert, reviewed by Sam at Parenthetical. Sam says, "Gilbert reads... with a tongue-in-cheek self-mocking quality that was essential to my enjoyment of the book." Edge of Dark Water by Joe R. Lansdale, read by Angele Masters, reviewed by Bob at The Guilded Earlobe. Bob says, "Full of adventure, dark humor and colorful characters, if you have yet to take a trip with Joe R. Lansdale there is plenty of room on this raft." The Kitchen Counter Cooking School by Kathleen Flinn, read by Marguerite Gavin, reviewed by Melissa at Book Nut. Melissa says, "I'll tell you straight up: I learned a lot from this book. A lot. And that was listening to the audio version. I need to go out and purchase the book, so I can have it as a reference in my kitchen." Krik? Krak! by Edwidge Danticat, read by Dion Graham and Robin Miles, reviewed by Lee of Reading With My Ears. Lee says, "Miles, a narrator I've never heard before, does the lion's share of the work and she is very good, skillfully using her voice to deliver all the pain and sorrow and odd moments of joy that Danticat's women experience." The Lincoln Lawyer by Michael Connelly, read by Adam Grupper, reviewed by Annette at Annette's Book Spot. Annette says, "I just want to be read to, you don't need to dramatize the text for me, and Grupper was great." Moscow Rules by Daniel Silva, read by Phil Gigante, reviewed by Lee at Reading With My Ears. Lee says, "As far as I could tell, everyone was consistently voiced, but ultimately it all sounded like a comedy act. The accents mostly sounded authentic to me (I'm really not a judge), but the Russians and Israelis began to blend together, and the French seemed off. The women were overly breathy and femmy and that -- coupled with their accents -- made them seem particularly caricatured." The Night Swimmer by Matthew Bondurant, read by Hillary Huber, reviewed by Laurie at Bay State Readers' Advisory. Laurie says, "The audiobook edition of The Night Swimmer... narrated absolutely perfectly by Hillary Huber, will be the first on my list of best audiobooks of 2012." The Rook by Daniel O'Malley, read by Susan Duerden, reviewed by Bob at The Guilded Earlobe. Bob says, "The Rook is one of the most fascinating Fantasies I have experienced in a long time, truly touching that sense of wonder as only the best Fantasies can." Rumo & his Miraculous Adventures by Walter Moers, read by Bronson Pichot, reviewed by Bob at The Guilded Earlobe. Bob says, "This novel reads like Shel Silversteins cleverest poems, and it will remind readers of my generation of classics like The Phantom Tollbooth." Situations Matter by Sam Sommers, read by Joshua Swanson, reviewed by Janssen at Everyday Reading. Janssen says, "Joshua Swanson is just as good a non-fiction narrator as he is for fiction." The Spellman Files by Lisa Lutz, read by Ari Graynor, reviewed by Melissa at Book Nut. Melissa says, "I was captivated by Isabel's voice (and Graynor's reading of her), her observations of her ex-boyfriends, the cases, and her family. It was a lot of fun to listen to."